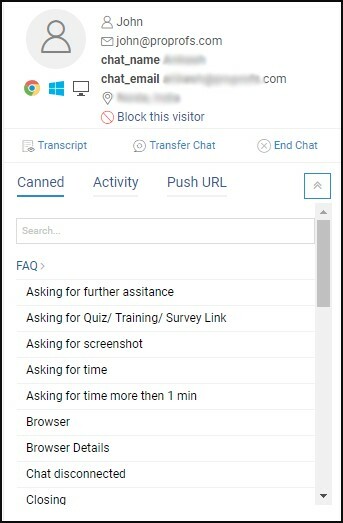 How Do I Add Canned Responses in Live Chat? Reply to the same customer questions with canned responses and save valuable time and effort. Save answers to common questions to shorten your response time and save keystrokes on repetitive typing. With canned responses, you type it once, save it and reuse it in chats and tickets whenever you need. Canned responses are predefined messages displayed to the operators with the intent of answering repeated questions consistently. It helps the operators with swift assistance to the customers, operators can search for particular canned responses through the search box. Thanks for your patience and for the opportunity to serve you. How may I assist you? Thanks for the opportunity to chat with you. May I help you? Hi! I notice that you are looking for specific information on our web site. May I assist you with your search or direct you to the appropriate page? Please do not hesitate to get in touch with us if you have any more questions. Is there anything else I can assist you with? Thank you for having visited our web site. We hope you will come back again. Thanks for chatting with me. I hope I was of assistance to you. Thank you. Before I say Good Bye I want you to know that we are always standing by to assist you in any way possible. Thanks. I have just responded to your query and I hope it meets with your satisfaction. Are you still with me? 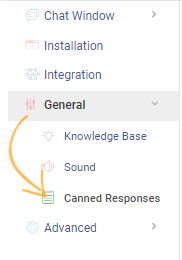 Step 1: Navigate to "Settings"-----> "General Settings" -----> "Canned Responses." 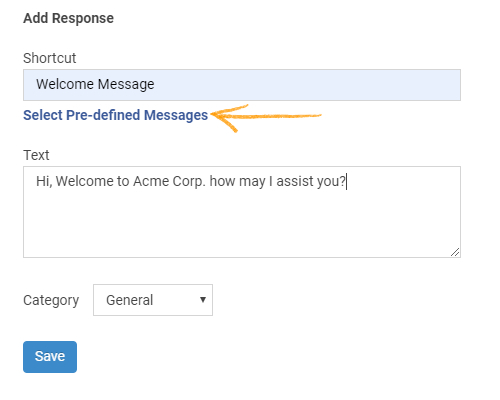 Step 2: To add a new canned response click "Add New." Step 3: Customize your canned response, you can also select responses from the library and add them to your account. Here's how the library of pre-defined messages will appear, select an appropriate message and click "Save" to add it to your live chat. 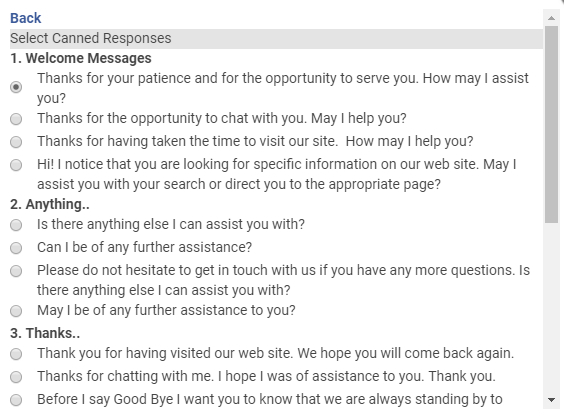 Operators can also save any specific response in their conversation with a visitor as a canned response. To learn more read Visitor Conversation Window. How do I Delete/Edit Canned Responses? To edit or delete canned responses, navigate to the specific response and click the edit or delete icon.